I mean, if a title like that doesn’t get me some angry comments, what will? They’re not baby names, they’re people names. You believe me, don’t you? …will return when I discover exactly why I can’t manage to embed links anymore. Is there something I don’t know? Well, here I am, somewhere between inappropriate modesty, nausea about self-promotion, and a constant effort to be more like Beyonce. Beyonce would never stress out about self-promotion. Welcome to my brand-new website, where I will write about the things I don’t write about elsewhere, or point to the things I do write elsewhere that you might not see if you don’t know. I write television shows–Degrassi, Lost Girl, Lost & Found Music Studios, and others you don’t even know yet that you’re gonna love. I write on LaineyGossip — about names, about TV, about feminism, about the scourge of kitten heels. 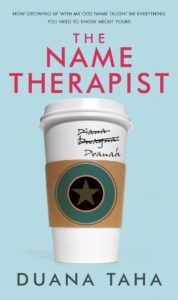 And I definitely wrote the book to your left, which is not a baby name book, but is about your name, and how the fact that you have certain feelings about it actually means a lot more than you think it does, and has a bigger impact in the world than you think it does. It’s great, and there are some hilarious and fascinating stories in it, as well as people with fascinating names. And yes, I’m working on another book, and no, it probably won’t be about names…at least directly. Now, the eternal question. Does one write another post immediately, so the lame ‘welcome-to-the-blog’ post isn’t right on top? Or give it a second so it looks a little authentic?